Tropical cyclones (typhoons in Asia and hurricanes in America) cause extensive damage, including loss of life, as mostly densely populated areas are exposed to this natural element. “So far, there was only limited knowledge about long-term changes in typhoon intensity as reliable data about typhoon activity exists only for recent decades (starting in the 80s). In particular, it was not clear whether the increase of intense typhoons, observed in areas where they occurred very rarely in the past, is within the range of long-term natural variability or if these extraordinary changes could be connected to climate change,” says Jan Altman, the leading author of the study, which resulted from the cooperation of Czech, Russian, South Korean and Swiss researchers. 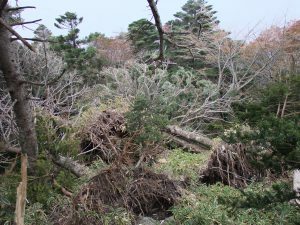 Information stored in tree-rings was used to discover the variability in past typhoon activity in East Asia, where researchers from IB CAS perform long-term exploration. “Tree rings serve as a chronicle where all important events occurring during tree life are stored,” explains Jan Altman. Thus, researchers could reconstruct disturbances in natural forest ecosystems induced by typhoons during more than the last 200 years, along a >1300 km long latitudinal gradient in South Korea and Russia. “Our results suggest that in the course of the 20th century a rapid increase in the destructive effects of TCs north of areas which are adjusted to typhoon occurrence took place. Our findings are important as affected regions were formerly situated at the edge of areas affected by TCs, and these areas are more sensitive to TC hazards because of a lack of experience-based adaptation strategies,” concluded Jan Altman.